Being a wedding photographer on this day brought me to the Lyman Estate! 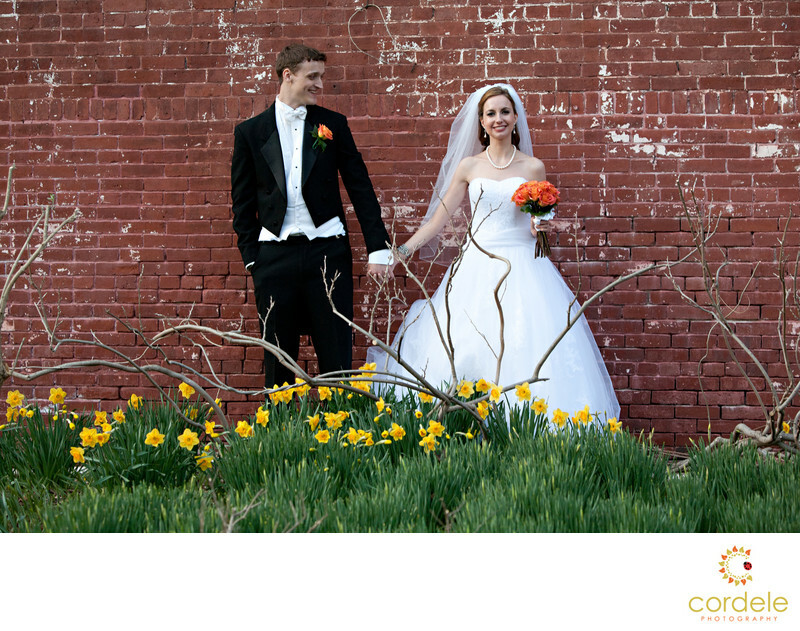 Here a bride and groom hold hands up against a brick wall at a wedding venue in Waltham MA. This was shot at the Lyman Estate in Waltham Ma. It's an old Victorian house that's been renovated and used for wedding. The Bride and groom were one of the cutest couples. They had such a sense of humor and during the speeches, they both said "We are going to say a few words" and then proceeded to drop a scroll of paper.... I love this photo because of the tree branches and the bricks and the flowers. There is something about the way it all lines up that looks so unique and different. the yellow flowers separating us from them and the sticks coming up make it feel mysterious but fun for a wedding photo. It's something different and that's what I love about wedding photography. Keywords: lyman estate (3), rustic (3), tuxes (3), yellow flowers (3).